This small tin and glass star light chandelier with inset frosted triangle shapes on each pane will illuminate your rustic decor. All of our star light fixtures are authentic creations handmade by artisans in Mexico. 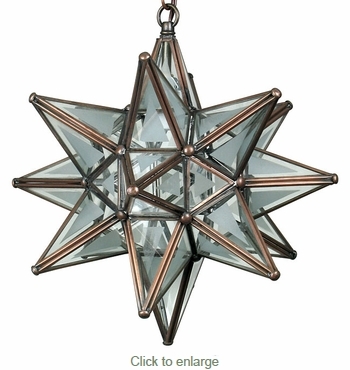 A hanging glass star lantern will complement your Spanish colonial, southwest, or Santa Fe style home.